Coal Miner’s pneumoconiosis, also known as black lung disease, is a condition often developed by workers in the coal industry, as well as anyone whose occupation involves long term inhalation of coal dust, man-made carbon, and graphite. Pneumoconiosis results when particles of dust from these substances build up in the lungs, irritating lung tissue and causing larger buildups which restrict breathing. Over time, the condition can worsen and cause significant disability for those who suffer from it. In these cases, long-term disability benefits may become necessary because maintaining gainful employment might become difficult or impossible. If you have developed pneumoconiosis and are unable to continue working, you may be eligible for long-term disability benefits. 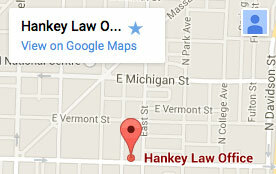 The Indiana long-term disability attorneys of the Hankey Law Office, have the experience and knowledge necessary to help individuals get the benefits they need. To speak with one of our skilled attorneys today, contact us at (800) 520-3633. In order to document your case of pneumoconiosis, a doctor will need to listen to your lungs, perform breathing tests, and take x-rays. When applying for long-term disability benefits, it is important to keep a record of all medical care and treatment for pneumoconiosis and related conditions. If you or a loved one is struggling with coal miner’s pneumoconiosis and is in need of long-term disability benefits, an Indiana long-term disability attorney of Hankey Law Office, can help. Contact our offices today to discuss your options with a knowledgeable disability attorney at (800) 520-3633.